Do you know how long we’ve been craving new space action on television? Gorram years. That’s how long. And tonight, Syfy is premiering a brand new show called Killjoys, about space bounty hunters. We’ve seen a couple episodes, and we’re here to tell you it’s a blast. 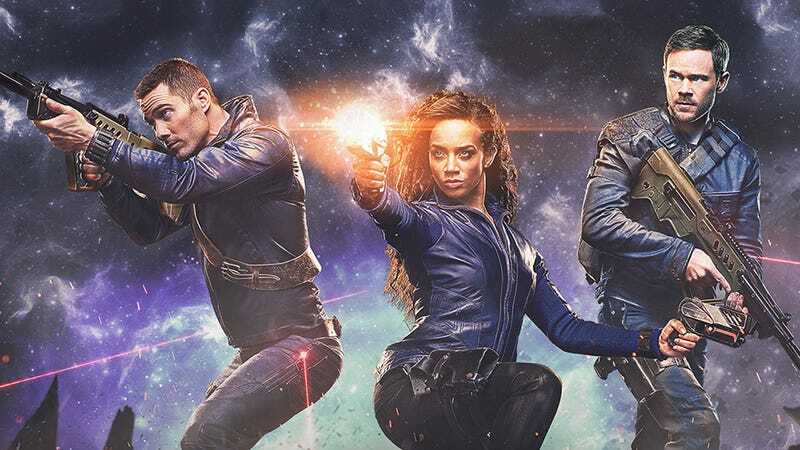 Killjoys joins Dark Matter in Syfy’s Friday night lineup, which means that there are two space action shows back to back. (Both shows are co-productions with the Canadian channel Space.) Two space opera shows! That’s two more than we’ve had in years, basically since the Stargate franchise folded. And Killjoys absolutely delivers what you want out of a space show. There’s a cool spaceship named Lucy, with a sassy A.I. in charge. There’s fancy flying, and tricky stunts, and narrow escapes. There are pew-pew-pew gunfights, too. There’s an awful lot of wild and crazy action, with characters who are just too dumb to avoid jumping feet first into the line of fire. In Killjoys, it’s the future, and humans are occupying a star system called the Quad, with four inhabited worlds. Everything is controlled by a dystopian company called The Company, but there are rebels working to defeat it. And our heroes are “Killjoys,” aka bounty hunters, who will find anybody (or anything) and bring it back, no matter what. The leader of our small crew is Dutch (Hannah-John Kamen), who’s a badass fighter with a secret past (that we learn about in the pilot.) Her right-hand man is John Jaqobis, played by Aaron Ashmore from Warehouse 13 (who’s basically doing his best Chris Pratt impression here.) And the third member of their crew is D’Avin, an ex-soldier played by Luke Macfarlane. In the proudest tradition of space action, our heroes bite off more than they can chew, hatch ridiculous plans that go totally sideways, and survive thanks to a mixture of luck and moxie. The show is the creation of Michelle Lovretta, who also created the sexdiculous Lost Girl. So you pretty much know what to expect — insane fashions, random cuteness, some queerness, and a generally light and breezy tone with hints of darkness judiciously mixed in. Killjoys reflects Lovretta’s longstanding obsession with class and economic oppression. A lot of the most interesting moments in the first couple episodes have to do with what it’s like to be under the thumb of the system, with no options. This universe doesn’t just have a corporatocracy, it also has various systems of indenture, and weird property and citizenship laws. There’s lots of room for this setting to grow into something really fascinating and intense. I’ve seen some reviews of Killjoys that criticize it for its lack of originality, or for not having clever enough plots. But you know what? We don’t need every television show to be True Detective or even Battlestar Galactica. If wanting to watch fun, quippy characters get into scrapes and survive by the skin of their teeth, on spaceships and alien planets, is wrong, I don’t want to be right. Killjoys has just the right mix of guns, high-tech knives, assassins, cage fights, missions to hostile planets, dark secrets, tiny robot weapons and general space headbutting thrills to be the perfect treat for Friday nights.